Whisk together all sweet and spicy sauce ingredients in a small bowl. Set aside. Toss broccoli florets in coconut oil and season with salt and pepper. Spread evenly on a greased baking sheet and bake for 20 minutes. Meanwhile, bring 1 1/2 cups of water to a boil in a medium saucepan, add rice, reduce to a simmer, and cover. Let simmer for 15 minutes until soft. Heat two tablespoons of olive oil on medium heat in a medium sized pan. Add chicken, season with salt and pepper, and cook until golden and fully cooked though, about 10 minutes. Add the sweet and spicy sauce and bring back to a gentle simmer. Simmer until sauce thickens and fully coats the chicken, about 3-5 minutes. 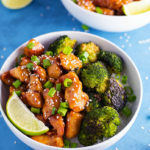 Serve rice in bowls topped with chicken and broccoli. Garnish with sesame seeds and green onions. Serve with lime wedges.